Dedicated to the Special and Limited Edition Mustangs from 1964 to the present. We have documented 95 general categories of Special Model Mustangs from the Mustang GT and Shelby through the Special Anniversary Editions, to the local "Territorial" Special Promotional Mustangs. We have details and examples of 346 Special Mustangs identified by year. The book listed below contains 662 special and limited edition Mustangs by year, grouped into 217 categories from 1964 to 2019. Special thanks to MustangAttitude.com for hosting all the examples of each of these Mustangs. 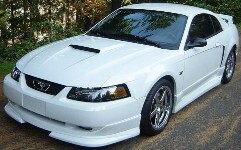 The 2001 Roush Mustang comes in three levels up featured upgrades: the Stage 1, Stage 2 and Stage 3. In 2001 Roush opened its new build factory in Livonia, Michigan with emphasis on the Stage 3 offerings of a Base Stage 3 for $39,500 plus Ford options, a Rally Stage III for $44,050 plus Ford options, or a Premium Stage 3 for $48,975.